The Liturgy Committee is responsible for planning various liturgies throughout the year. 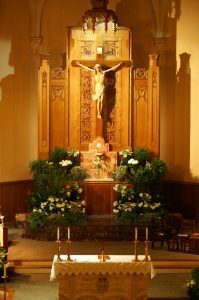 It is also responsible for the decorations in the church and at the altar. In addition, it prepares the schedules for the servers, Eucharistic ministers, lectors, cantors, organists and greeters. Time required: Members of this committee attend a two-hour meeting the second Saturday of the month. Saturday Vigil Mass - 6:30 p.m.
St. Bridget - 7:45 a.m.
Tuesday and Thursday - 8:30 a.m.
Tuesday and Thursday - 7:50 – 8:20 a.m.
Wednesday - 5:20 - 5:50 p.m.
Friday - 7:30 - 8:00 a.m.
Saturday 9:00 – 10:30 a.m.
each Tuesday 6:00 – 8:00 p.m.